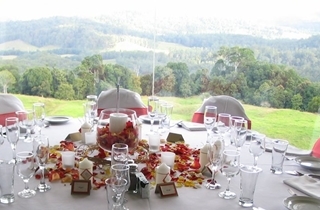 Nestled on the southern escarpment of Queensland’s beautiful Blackall Range with stunning views to the magnificent Glasshouse Mountains, Tranquil Park Mountain Resort is the serene and romantic setting for your wedding. 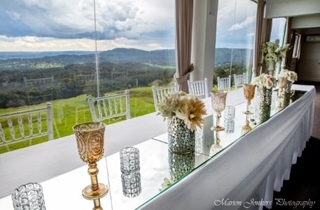 Your ceremony can be held on our beautiful deck overlooking the magnificent Glasshouse Mountains and we have two wonderfully appointed function rooms with floor to ceiling glass walls also overlooking the beautiful Glasshouse Mountains. 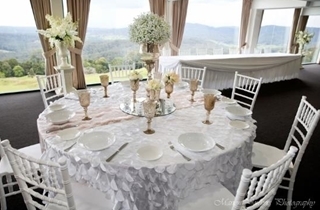 Tranquil Park can also accommodate the bride and groom and some of your guests in 31 2 - 3 bedroom units. With its floor to ceiling panorama The Glasshouse Room can accommodate minimum 60 to a maximum of 130 guests in relaxed comfort and style. With its very own dedicated Bar and Dance Floor it also boats a fully functioning Catering Kitchen and a Private Deck to enjoy our fresh Mountain Air. Be it Traditional, Glam, Vintage or even Elvis we have the know-how and contacts to make your day in every way Perfect. Hor-D Oeuvres and your wedding cake for dessert.